Liver cancer is the fifth most common cancer in men, the seventh most common in women, and the third most common cause of death from cancer worldwide. Only 30-40% of liver cancer patients present early enough to undergo curative treatments such as surgery or liver transplantation. Local treatment with radiofrequency ablation or ethanol injection is often reserved for non-surgical candidates with early stages of disease. Transarterial embolization has become a widely accepted treatment for asymptomatic patients with unresectable lesions. This review discusses in details the three major forms of transarterial therapies: Bland embolization, chemoembolization, and radioembolization. Overlap syndrome in hepatology is emerging as a diagnostic and therapeutic challenge, which is further complicated by the present gaps in the information regarding the immunopathogenesis of these diseases. The present review represents a concise review of literature on overlap syndromes with emphasis on prevalence, etiopathogenesis, clinical presentation, diagnosis, and management of true overlap syndromes. Background/Aims: To assess the antiviral efficacy of lamivudine (LAM), entecavir (ETV), telbivudine (LDT), and lamivudine and adefovir dipivoxil (CLA) combination in previously untreated hepatitis B patients at different time points during a 52-week treatment period. Patients and Methods: A total of 164 patients were included in this prospective, open-label, head-to-head study. Serum levels of alanine transaminase (ALT), hepatitis B virus (HBV) DNA, and hepatitis B e antigen (HBeAg) were measured at baseline, and at 12, 24, and 52 weeks of treatment. Results: Median reductions in serum HBV DNA levels at 52 weeks (log 10 copies/mL) were as follows: LAM, 3.98; ETV, 3.89; LDT, 4.11; and CLA, 3.36. The corresponding HBV DNA undetectability rates were 83%, 96%, 91%, and 89%, respectively. These two measures showed no significant intergroup differences. Clinical efficacy appeared related to HBV DNA level reduction after 24 weeks of therapy. Patients were divided into three groups based on HBV DNA levels at week 24: Undetectable (<10 3 copies/mL), detectable but <10 4 copies/mL, and >10 4 copies/mL. Patients with levels below quantitation limit (QL) were analyzed at 52 weeks for HBV DNA undetectability rate (94%), ALT normalization rate (83%), and viral breakthrough rate (0%). The corresponding values in the QL-10 4 copies/mL group were 50%, 75%, and 13%, whereas those in the above 10 4 copies/mL group were 53%, 65%, and 18%. There were significant differences at week 52 for HBV DNA levels and viral breakthrough rate between the three groups. Conclusions: Different nucleos(t)ide (NUC) analogues tested exhibited no significant differences in effectiveness for Chinese NUC-naive HBV patients during 1-year treatment period. Background/Aims: Inadequate bowel cleaning leads to a suboptimal colonoscopic examination. Gum chewing has been reported to have a favorable effect on postoperative bowel functions. We conducted this study to establish if gum chewing added to high-dose senna before colonoscopy promotes bowel cleaning. Patients and Methods: In this randomized controlled study, consecutive outpatients scheduled for elective colonoscopy were randomized into two groups. Group 1 patients (n = 65) used senna solution 150 mL (300 mg senna) the night before colonoscopy. The patients also used sennoside tablet 80 mg daily for 3 days before the colonoscopy. Patients in group 2 (n = 64) were additionally advised to chew sugarless gum half an hour three-times daily after meals for these 3 days. The overall quality of colonoscopy cleaning was evaluated using the Aronchick scale by a single endoscopist who was blinded to the intervention. Difficulty of procedure, patients' tolerance, and adverse events were also evaluated. Results: A total 129 patients were enrolled in the study. Superior cleaning was found in gum chewing group when compared with other group particularly in the cecum and ascending colon. Cecal intubation time was significantly shorter in the gum-chewing group (8.6 ± 5.1 and 7.1 ± 2.8 min, P = 0.03). Adverse events were more common in group 1 compared to the gum-chewing group. Conclusions: Gum chewing enhances colonoscopy bowel preparation quality. Moreover, it is a physiologically sound, safe, and an inexpensive part of the colonoscopy bowel preparation. Gum chewing could be advised in addition to high-dose senna containing bowel preparation. Background/Aim: There are currently no data on the relative retention rates of the Instinct clip, Resolution clip, and QuickClip2Long. Also, it is unknown whether retention rate differs when clips are applied to ulcerated rather than normal mucosa. 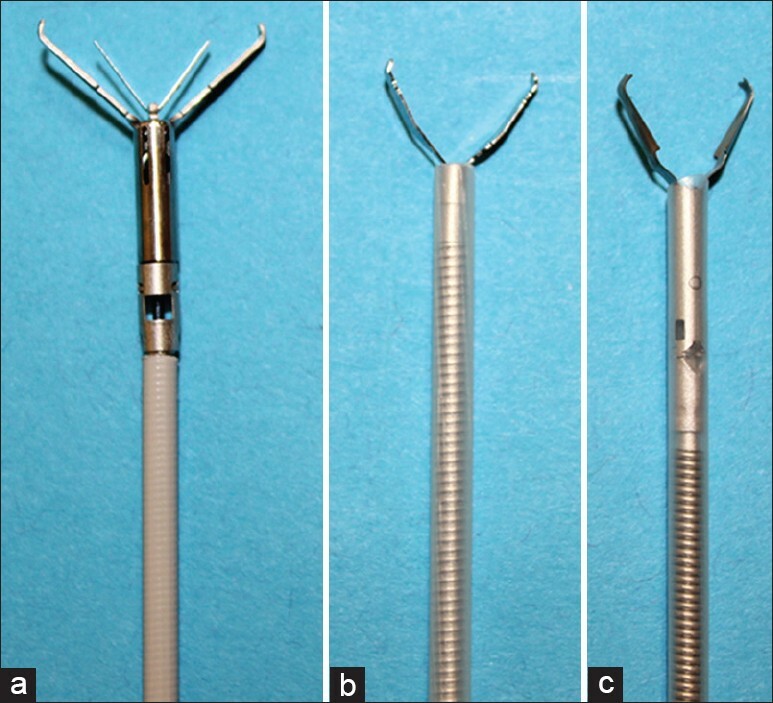 The aim of this study is to compare the retention rates of three commonly used endoscopic clips. Materials and Methods: Six pigs underwent upper endoscopy with placement of one of each of the three types of clips on normal mucosa in the gastric body. Three mucosal resections were also performed to create "ulcers." Each ulcer was closed with placement of one of the three different clips. Repeat endoscopy was performed weekly for up to 4 weeks. Results: Only the Instinct and Resolution clips remained attached for the duration of the study (4 weeks). At each time point, a greater proportion of Instinct clips were retained on normal mucosa, followed by Resolution clips. QuickClip2Long had the lowest retention rate on normal mucosa. Similar retention rates of Instinct clips and Resolution clips were seen on simulated ulcers, although both were superior to QuickClip2Long. However, the difference did not reach statistical significance. All QuickClip2Long clips were dislodged at 4 weeks in both the groups. Conclusions: The Resolution and Instinct clips have comparable retention rates and both appeared to be better than the QuickClip2Long on normal mucosa-simulated ulcers; however this did not reach statistical significance. Both the Resolution clip and the Instinct clip may be preferred in clinical situations when long-term clip attachment is required, including marking of tumors for radiotherapy and anchoring feeding tubes or stents. Either of the currently available clips may be suitable for closure of iatrogenic mucosal defects without features of chronicity. 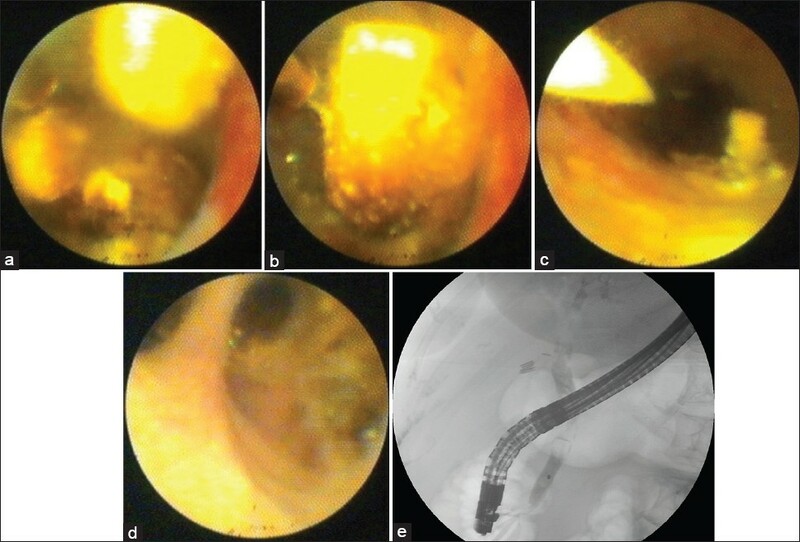 Background/Aims: We aimed to evaluate the efficacy and safety of Spyglass-guided electrohydraulic lithotripsy (EHL) for difficult common bile duct stones (CBD) not amenable to conventional endoscopic therapy. Design: A retrospective study evaluating the efficacy of Spyglass-guided EHL in treating difficult CBD stones, in a single tertiary care center. Patients and Methods: All patients who underwent Spyglass-guided EHL from 2012 to 2013 were compared with a historical cohort who had ECSWL. Results: A total number of 13 patients underwent Spyglass-guided EHL, 8 (61.5%) of them were males. The mean age was 46.5 ± 5.6 years. Bile duct clearance was achieved in 13 (100%) of them. Seventy-six percent required only one Endoscopic Retrograde Cholangiopancreatography (ERCP) to clear the CBD, 7.7% required two ERCPs, and 15.4% required three ERCPs. Adverse effects (cholangitis) occurred in one patient (10%), whereas only 30 patients (64.4%) of the ESWL group had complete CBD stone clearance. Thirty-seven percent required one ERCP to clear the CBD, 35.6% required two ERCPs, and 20% required three ERCPs. Adverse effects happened in seven (15.5%) patients, where five (11%) had cholangitis and two (4.4%) had pancreatitis. Conclusion: Although a retrospective design with a small sample size, we concluded that Spyglass-guided EHL is an effective procedure in treating difficult CBD stones. Background/Aim: Phospholipase C epsilon 1 (PLCE1) plays a crucial role in carcinogenesis and progression of several types of cancers. A single nucleotide polymorphism (SNP, rs2274223) in PLCE1 has been identified as a novel susceptibility locus. The aim of the present study was to investigate the role of three potentially functional SNPs (rs2274223A > G, rs3765524C > T, and rs7922612C > T) of PLCE1 in gastric cancer patients from Kashmir Valley. Patients and Methods: The study was conducted in 108 GC cases and 195 healthy controls from Kashmir Valley. Genotyping was performed by polymerase chain reaction-restriction fragment length polymorphism method. Data were statistically analyzed using c2 test and logistic regression models. A P value of less than 0.05 was regarded as statistically significant. Results: The frequency of PLCE1 A2274223C3765524T7922612, G2274223C3765524T7922612 , and G2274223T3765524C7922612 haplotypes were higher in patients compared with controls, conferred high risk for GC [odds ratio (OR) =6.29; P = 0.001; Pcorr = 0.003], (OR = 3.23; P = 0.011; Pcorr = 0.033), and (OR = 5.14; P = 0.011; Pcorr = 0.033), respectively. Smoking and salted tea are independent risk factors for GC, but we did not find any significant modulation of cancer risk by PLCE1 variants with smoking or excessive consumption of salted tea. Conclusion: These results suggest that variation in PLCE1 may be associated with GC risk in Kashmir Valley. Backgrounds/Aims: To study the efficacy and safety of drotaverine hydrochloride (HCl) 80 mg tablet given thrice a day in the symptomatic relief of patients with irritable bowel syndrome (IBS). Patients and Methods: The study was a multicentric, randomized, double-blind, placebo-controlled parallel group study performed at three centers. The patients who fulfilled Rome II Criteria of IBS were included in the study. A total of 180 patients with IBS were randomized to drotaverine and placebo treatment groups. Abdominal pain and stool frequency were measured every week in both the groups for all the 4 weeks of treatment duration. 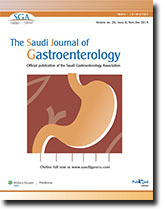 Subject Global Assessment of Relief (SGA) of IBS symptoms was assessed at the end of the study. Appropriate statistical analysis was done using SPSS software. Statistical Analysis Used: Mann-Whitney U-test (two-tailed), Wilcoxon signed ranks test, and McNemar tests. Results: Pain frequency decreased significantly (P < 0.01) in 22 (25.9%), 51 (60%), and 66 (77.7%) patients in the drotaverine group, at the end of 2 nd , 3 rd , and 4 th weeks, respectively, as compared with 8 (9.4%), 18 (21.2%), and 26 (30.6%) in the placebo group. Pain severity scores also decreased significantly in the drotaverine group 66 (77.7%) as compared with placebo 26 (30.6%) after 4 weeks. Drotaverine HCl was shown to provide significant improvement (P < 0.01) in global relief in abdominal pain as perceived by the patient (85.9% vs 39.5%) and the clinician (82.4% vs 36.5%) in the drotaverine group as compared with placebo. There is significant (P < 0.01) improvement in stool frequency in drotaverine HCl treatment group as compared with placebo. The drug is well tolerated without any major side effects. Conclusions: A 4-week treatment with drotaverine significantly improves abdominal symptoms in patients with IBS. 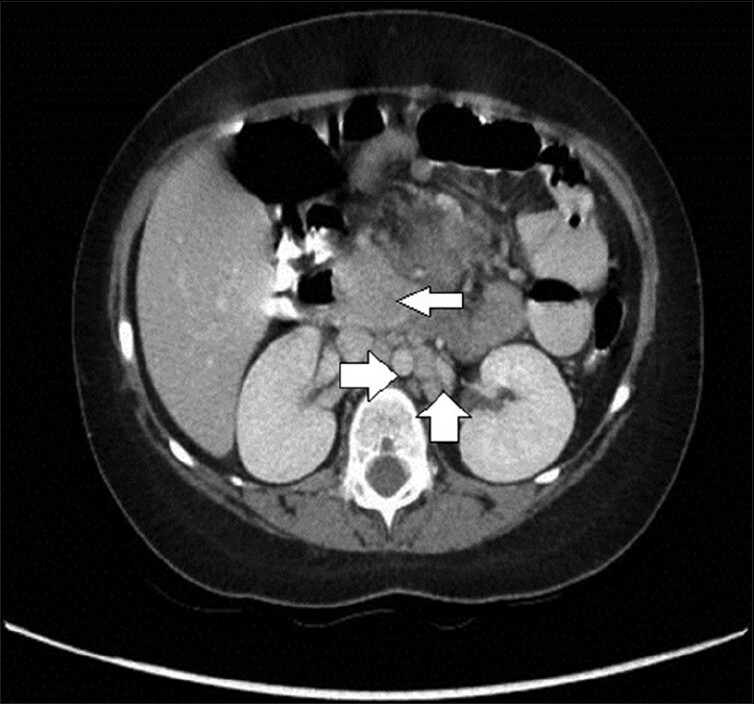 We are presenting the case of a 62-year-old woman who developed a pneumomediastinum as a complication of anastomotic leakage (AL) following laparoscopic sigmoid resection due to diverticulitis. The patient presented with retroperitoneal air, pneumomediastinum, emphysematous gall bladder, air in the wall of stomach, and proximal small bowel. There were a few tiny air bubbles around the anastomosis. 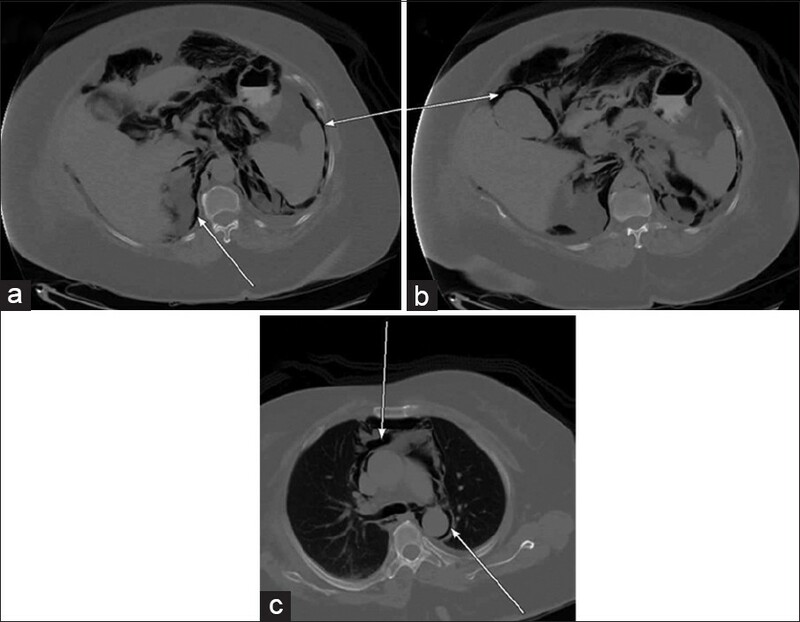 We discuss this unusual clinical presentation of intraperitoneal and extraperitoneal air as a presenting sign of AL. Sclerosing mesenteritis (SM) is a rare, benign inflammatory disorder of unknown etiology, affecting the membranes of the digestive tract that involves lymphoplasmacytic inflammation, fat necrosis, and fibrosis of the mesentery. We report a child patient with a history of recurrent abdominal pain and fever who was found to have an intra-abdominal mass suspicious for malignancy. A tissue biopsy revealed the diagnosis of SM associated with IgG4-related systemic disease. The patient is currently maintained on 5 mg prednisone daily and no recurrence of symptoms was noted during the 24-month follow-up period. We emphasize, therefore, that SM can present clinical challenges and the presence of SM should cue clinicians to search for other coexisting autoimmune disorders that can have various outcomes.